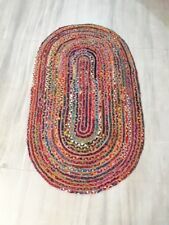 ROUND BRAIDED JUTE RUG. We source the highest grade jute from Bangladesh to ensure quality of the products is exceptional. · Materials: cotton Jute. · Technique: Hand Braided. Adding warmth and charm to any space, the versatile oval Christmas rug is perfect for kitchen, entryway, family room or bedroom. Spot clean.